Mackenzie Clement, left, of Clearview hat a had trick and three assists on Tuesday. Mackenzie Clement notched her second hat trick of the season and tallied three assists in the Clearview girls' soccer team's 6-3 win over Williamstown on Tuesday. Jackie Norris scored twice, and Elizabeth Bonomo added one goal and an assist. Rachael Hollywood had two assists, and goalkeeper McKenna Dalfonso made 12 saves. Meghan Guarente scored two goals in Gloucester Tech's 7-0 win over Westhampton Tech in the NJTAC Tournament. Guarente has now scored two-or-more goals in four straight games. Emily Bylone, Kayla Dajnowski, Adrianna Pepe, Cassie Reyes, and Siearra Stichler also scored. Bella Runyan had a hat trick, and Madison Bouggess added two goals as Moorestown Friends defeated Abington Friends, 6-2. Bebel Trani also scored for Moorestown Friends. Woodstown defeated Gloucester, 2-1, behind Maddy Hunt's two goals. Goalkeeper Sadie Boatright made six saves. Hannah Keane scored twice in Ocean City's 3-0 win over Oakcrest. Summer Reimet added a goal, and Kelsey White and Suzy Dietrich chipped in assists. Goalkeeper Abbey Fenton made five saves. Tori Griffiths had her third hat trick of the season as Kingsway defeated Hammonton, 10-0. Devin Harkins scored two goals, and Julia Amoroso, Hailey Ferry, Morgan Klaiss, Madison Maguire, and Peyton Rieger tallied goals. Abbie Brown chipped in three assists. Sara Nelson's two scores led Haddon Township to an 8-0 win over Woodbury. Sydney Metz, Rachael Parker, Ella O'Connor, Jamie Kennedy, Mary Gerber, and Carly Shaw scored. Siani Carpenter had a hat trick, and Karin Gaft scored twice as Overbrook defeated Gateway, 5-1. Goalkeeper Taylor Gresh saved six shots. Carpenter has scored in eight straight games and has two hat tricks this season. Abby Marthins scored in the second half to give Haddonfield a 1-0 victory over Collingswod. Emma Wister scored twice in Sterling's 4-0 win over Audubon. Olivia Sims tallied a goal and two assists, and Samantha Gross added a goal. Goalkeeper Amaya Reed-Clark made 12 saves as Paulsboro shut out Lindenwold, 3-0. Jackie Richards scored two goals, and Kimmy Robinson added a score. Jordan Obermeier scored twice, and Lauren Cates, Chigozie Chukeunyere, and Bella McCollister scored in Moorestown Friends' 5-0 win over Friends' Central. Gigi McAlpin led Clearview with two goals in a 5-0 victory over Williamstown. Kayla Mills, Olivia Sindoni, and Grace Trovato also scored. Keasia Anthony, T'Aja Goodwin, Maddie Grusemeyer, Emily Pew, and Aliyah Thomas scored in Salem's 5-0 victory over Penns Grove. Megan Normile, Elle Alves, and Ashlynn Bock scored as New Egypt defeated Burlington City, 3-1. 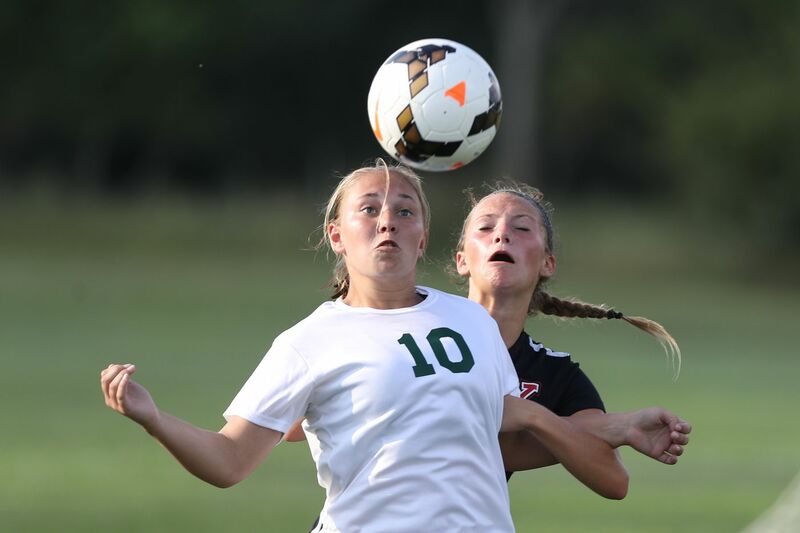 Cienna Bosher, Anna Neild, and Gianna Traenkner scored as Highland defeated Deptford, 3-0. Sean Fatiga's two goals and one assist led Kingsway to a 3-0 win over Hammonton. Goalkeeper Justin Branyan saved three shots. Fatiga has scored in eight straight games and has two goals in each of his past four matches. Usmar Barrera and Maykon Hernandez scored two goals as Vineland topped Cedar Creek, 6-0. Christopher Arellano and Lucas Portadin added goals, and George Vera made six saves in goal. Elkin Bonilla-Hernandez scored twice as Seneca defeated Camden Catholic, 7-0. Owens Bonilla-Hernandez, Tommy Fox, Johnny Meale, Eric Pierre, and Scott Spruill also scored. Seneca's Luke Leach failed to score for the first time this season, but he had two assists. Maple Shade topped Medford Tech, 2-1, behind goals from Timur Rozikov and Daniel Vallen. Jose Gonzalez Silva and Jesus Ponce picked up assists. Cody Beato, Ryan Carter, Connor Dillard, and Santino Mancini scored in Glassboro's 4-0 win over Penns Grove. Mancini, Justin Tongue, and Doel Collazo tallied assists. Goalkeeper Griffin Rogers made five saves. Andrew Hough scored two goals in Haddon Township's 7-2 victory over Woddbury. Graham Dengler, Brian Madden, Noel Gumbrecht, Jackson Green, and Brian Burns also scored. Goalkeeper Brett Hintz made 10 saves. Chris Williams had two goals as Woodstown defeated Gloucester, 7-1. William Gantz, Trevor Lodge, Nick Mahoney, Jake Moore, and George Rey also scored.